There are 2 Memory Care Facilities in the Marysville area, with 1 in Marysville and 1 nearby. To help you with your search, browse the 7 reviews below for memory care facilities in Marysville. On average, consumers rate memory care in Marysville 4.8 out of 5 stars. Better rated regions include Mukilteo with an average rating of 5.0 out of 5 stars. According to the Alzheimer's Association, the rate of Alzheimer's is increasing in Washington. Currently, about 110,000 seniors in the state have Alzheimer's, and it's projected that the number of diagnosed cases will increase by more than 25 percent in the coming years. In Marysville, the senior community comprises more than 12 percent of the population of 69,000. To accommodate local seniors with Alzheimer's and dementia, the Marysville area has two memory care facilities. One of these facilities is located in the city proper, and the other is in nearby Everett. In Washington, memory care facilities may be located within assisted living facilities that specialize in caring for those with dementia. Washington does not have a state income tax, meaning that all types of retirement income are tax-free. This may make memory care expenses easier to afford. Short-term particle pollution levels are high in Snohomish County, which may be a concern for seniors in Marysville who have a respiratory illness or cardiovascular disease. The American Lung Association gave the county an F for 24-hour particle pollution and ranked it 15 out of 201 metropolitan areas for this type of pollution. While the cost of living in Marysville is high in relation to the overall national average, it is slightly lower than the statewide average. Healthcare expenses are about 20 percent lower here than in the nation as a whole, which may leave residents with more money for memory care in this city. On a scale of one to 100, with a lower score indicating less crime, Marysville's property crime rate is 54.4, which is about 16 points higher than the national average. However, the city's violent crime rate is 17.2, which is notably lower than regional, state and national averages. This may appeal to families who are helping their loved ones move to a memory care facility in the city. Memory Care costs in Marysville start around $0 per month on average, while the nationwide average cost of memory care is $4,800 per month. To see a list of free memory care resources in Marysville, please visit our Assisted Living in Washington page. 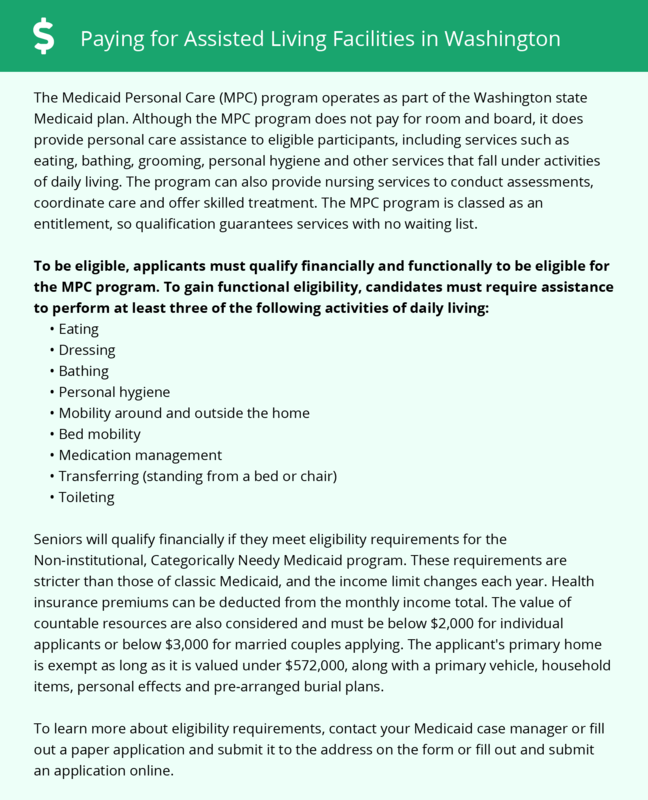 Marysville-area assisted living communities must adhere to the comprehensive set of state laws and regulations that all assisted living communities in Washington are required to follow. Visit our Memory Care in Washington page for more information about these laws.